Coffee with yogurt is one of my favourite things. I've had two kinds in Hanoi, the more common flaked ice, vinamilk yogurt, condensed milk and coffee combination, but the frozen yogurt version is my favourite. I've only had the frozen version at Cafe Duy Tri on Yen Phu near Truc Bach lake, which is definitely worth a stop next time you're in Hanoi. We were in Saigon over Thanksgiving week but did not come across these fascinating coffees! This sounds completely heavenly. I'm going to have to either track down or master that egg coffee myself! Coffee is an essential part of my life, I need at least three cups a day to feel good, maybe I am a coffeeholic, but I accept this weakness of mine!What I want is to try new and different ways of preparing coffee, so if you have possibilities, please publish some recipe with prepare guidance! I tried Ca Phe Trung at Cafe Pho Co last month and can't argue with you: absolutely delicious, and surely a very nice alternative to eggnog during the festive season in South East Asia! Thanks for bringing back some sweet memories with this post.. These both look delicious. But 8 glasses of Vietnamese coffee a day?! Just two gave me the shakes until midday when I was there! I've been buying ground Vietnamese coffee at the Asian mall here and mixing it into my daily brew. No other coffee has that wonderful chocolatey flavor. Suddenly, my morning coffee seems more like a cup of *meh*! And that avocado-yogurt...? I am buying a big-azz avocado today. Then I'm going to book a flight to Hanoi. Wow nice post guys. I really did not know that there are so many different types of coffee. Thanks for sharing it. This post seriously makes me want to go to Vietnam. 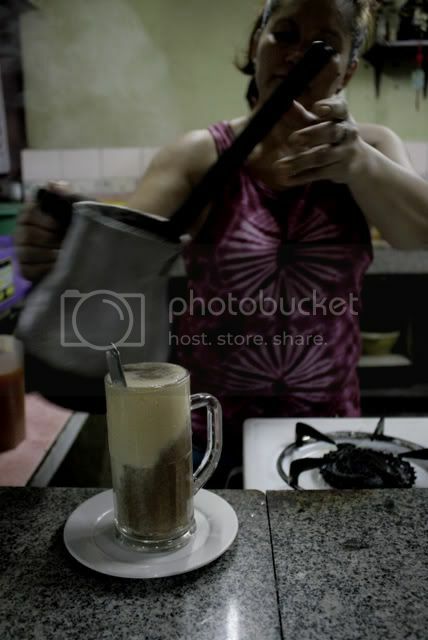 On the egg custard drink, we have a similar thing here in the Philippines called kinutil. Except it is made with hot cacao, egg, milk, and palm wine. Like egg nog with cacao. Something different. It's not for everyone, but a few are crazy about it. They sell it in gallon jugs for people vacationing by the ocean. Wow Beatrice -- that sounds fantastic! I love, love Philippine cacao. In fact I have some in my cupboard. No palm wine though. Perhaps rum will do? Thank you for the comment and the heads up. Tracey - you would LOVE Hanoi. If you go contact @stickyinhanoi and @vietnamesegod (on Twitter) for a street food walk. We ate so very, very well with them. Fun guys too. Trish, I need 2, sometimes three to get me going in the am. Then there's mid-morning, post-lunch, mid-afternoon, early evening .... it adds up! Couldn't drink coffee like that in Italy but something about the heat in Viet. Florence, you're welcome. Thanks for reading. Jilly, have a look at the link to the tea with egg on Sumatra ... I suspect the preparation is similar. Hi Manisha -- I believe these are n Viet/Hanoi specialties. We lived in Saigon for 2.5 yrs and never came across either, haven't seen them on return trips either. Lili, thanks for the tip, noted for the next trip! I just love the creaminess of the yogurt at Cafe My, and it's not *too* sweet. Ack.. message me your address and I'll post you the best cacao tablea I've tried locally! Never tried avocado with yogurt but alwats had it with condensed milk growing up in Manila in the summer, with crushed ice of course. Fantastic coffee stories.Some of them were really new to me, such as the avocado yogurt coffee. It was always called Cafe Sinh Vien, since it was populated by sunflower-seed-peeling students all day and night, who could only rarely could afford the ca phe trung specialty. Do you remember where Cafe My is? Not finding it on Google. We thought we would give it a try while we're in Hanoi for the next few days! Thanks! We are looking for coffee trenders would like to guest blog at on our website TheCoffeeLocator – a coffee marketplace . You can write anything from a one-off article, or become a regular blogger. Please let us know by email or through the website. We are particularly interested in stories from around the world just like this.